Republicans say the average family health insurance premium has increased by $4,154 under President Obama. That’s right — and it’s a much slower rate of growth than under President George W. Bush. In fact, employer-sponsored premiums have been growing at moderate rates for the past few years. This is a prime example of what we call a “true, but” claim: an assertion that’s technically correct, but changes in meaning or significance once it’s put in context or fully explained. The average employer-sponsored family premium has gone up by $4,154 under Obama, from 2008, before he took office, to 2014, according to the Kaiser Family Foundation’s annual employer survey conducted with the Health Research & Educational Trust. The catch? That’s relatively slow growth for premiums. The RNC may cast it as bad news, but it’s an improvement compared with the growth in premiums before Obama took office. In an online petition to repeal a tax on medical devices, the RNC goes so far as to claim average family premiums “have skyrocketed” under Obama. Skyrocketed? More like inched up. The RNC gives the stat after saying that “Obamacare has been a failure.” That’s the RNC’s opinion, but it’s not supported by this statistic, which includes premium growth before the law was even enacted. If the RNC wanted to show what has happened to employer-sponsored premiums under the Affordable Care Act, it should have started the clock in 2010, the year the law was passed. But that makes Obama look better. The rate of growth in average premiums from 2010 to 2014 is 22 percent. Even then, the increase isn’t completely attributable to the ACA. 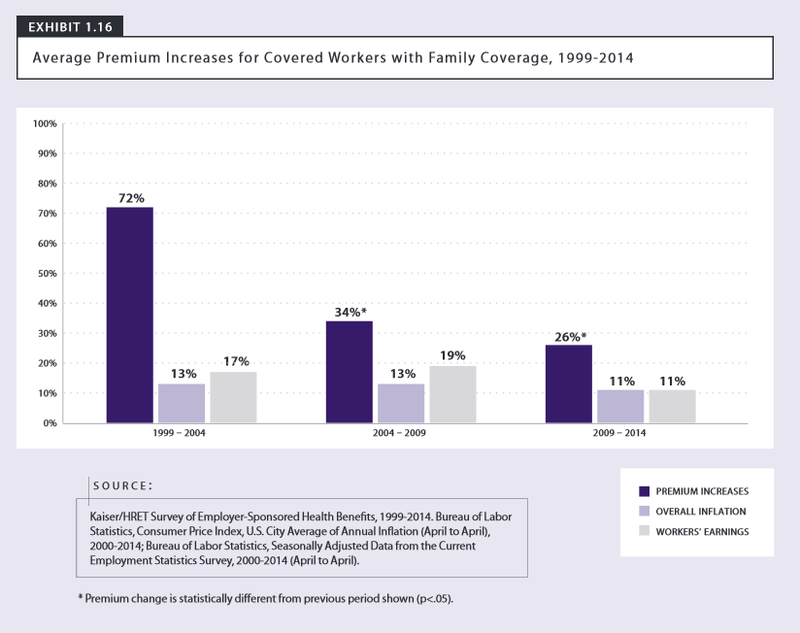 Premiums have been going up every year since the KFF survey started measuring them in 1999. Most of the major provisions of the law didn’t go into effect until 2014, but the growth in the average family premium for that year was a mere 3 percent. That doesn’t mean the ACA was responsible for the slowdown in growth, either. The Obama administration has, in fact, boasted many times of the recent slow growth in health care spending overall. From 2009 to 2013, total health care expenditures for the U.S. have been rising at rates around 4 percent per year (see Table 1). The journal Health Affairs noted that such rates are the lowest since the Centers for Medicare & Medicaid Services started compiling the National Health Expenditure Accounts data in 1960. While premiums have been growing, so too has the percentage of plans with deductibles. KFF President and CEO Drew Altman said in a press release on the latest employer survey: “The relatively slow growth in premiums this year is good news for employers and workers, though many workers now pay more when they get sick as deductibles continue to rise and skin-in-the-game insurance gradually becomes the norm.” In 2009, 63 percent of covered workers with single coverage had plans with annual deductibles; in 2014, 80 percent had such plans. The RNC’s “fact check” goes on to list more figures from the KFF survey, including the accurate statistic that the average premium for single coverage through employers has gone up 28 percent “under Obama” That’s right again, but much lower than the growth of individual premiums during Bush’s first six years. That increase was 72 percent.